I’m not usually very welcoming to tonal “neo-simplicity” – featured in the music of Pärt, Gorecki, Silvestrov and the likes – or to some the repetitive minimalism of Philip Glass or Michael Nyman when they rely on simplistic and saccharine harmonies, but I’ve just waxed enthusiastic about the string quartets of Gavin Bryars (see my review of The Balanescu Quartet’s “The Last Days” on Argo 448 175-2 and of The Lyric Quartet on Black Box BBM1079). It seemed (seems) to me that Bryars had found the way there to write hugely lyrical music without lapsing into the saccharine and sentimental, and put the lie to the philistines who claim that no beautiful music has been written since Britten or Shostakovich. So I decided to try more, and this CD was in the vast backlog of unheard purchases that I’ve accumulated over the years – and worse since my divorce (which happened over half a century ago, so you get the picture). I’m not as entirely enthusiastic as with the Quartets, though. The huge lyricism of Bryars’ music lacks sometimes an element of complexity, I find, to be fully satisfying. 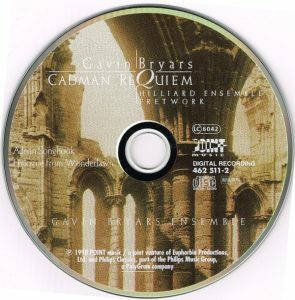 There’s a certain originality to the Cadman Requiem, written in the memory of Bryars’ friend and of sound-engineer Bill Cadman, killed in the Lockerbie air crash caused by a terrorist bombing in December 1988. First in the choice of texts, since Bryars sets only the Requiem and Agnus Dei from the Requiem Mass proper and, as a conclusion and like Fauré, the In Paradisum from the Burial Mass. In between, as movements 2 and 4, he sets one of the earliest poems in Old English, Caedmon’s Creation Hymn, both in its original language (4th movement, sung by baritone solo) and in Bede’s Latin transcription (2nd movement, tenor solo). But that’s secondary. Musically, the Requiem is slow-moving, somber, mourning, which is no surprise in a Requiem, but also very “Medieval”-sounding at times – Medieval music heard through the prism of 20th century music, as it were. Part of it comes from the fact that the accompanying ensemble is comprised of six viols (played by the early music ensemble Fretwork), but also that Bryars’ harmonies “rub”, using, it seems, adjacent tones. The Requiem part (track 1) evokes plainchant and the mystical chants of Hildegard von Bingen, and the Agnus Dei (track 3) brings to mind the polyphonies of Perotin, and in the slowly unfolding In Paradisum (track 5) there is a sense of appeased welcome into another world. 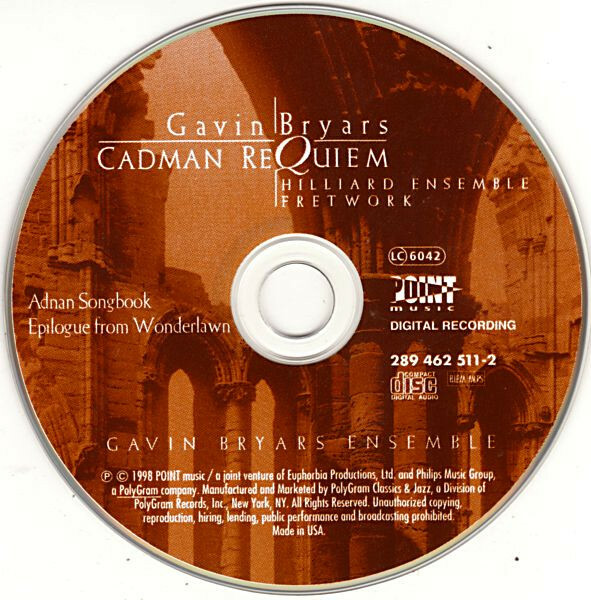 The two Caedmon settings (and the Lux aeterna part of the Agnus Dei) are still somber but more dynamic – there is a kind of soft motorism in the music that evoked some arias from Stravinsky’s The Rake’s Progress, or from Carl Orff’s Carmina Burana – and more into the norm and style of Philip Glass’ minimalism. 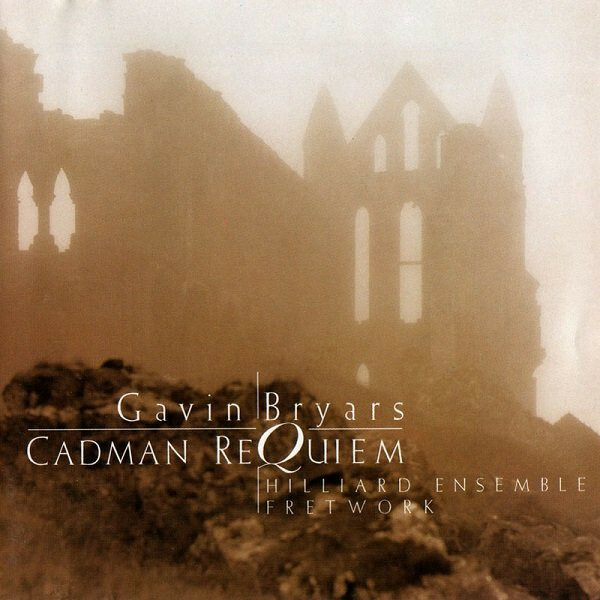 But there is indeed a mystical and haunting beauty in that (apparent) simplicity of Bryars’ Cadman Requiem. The Adnan Songbook, completed in 1996, sets eight love poems by Lebanese/American poet Etel Adnan, from her collection “The Indian Never had a Horse and Other Poems” (1985). The poems are magnificent – why hasn’t this woman been awarded the Nobel prize? Well, it’s not too late, so just wait, but not too long, please… – and Bryars’ setting, for high soprano and a small ensemble of two violas, cello, double-bass, electric guitar doubling acoustic guitar and bass clarinet doubling clarinet, is hugely lyrical and melodious. But the moods don’t change much in the course of the eight songs – sensuous and elegiac. A certain un-satisfaction derives after a while from the sameness – Bryars seems content to unfold his radiant lyricism, but it sounds at times a little too much like (again) Anne’s Arias in the Rakes Progress or Barber’s Knoxville, when not like a Bernstein kind of Broadway, and the composer seems to have placed to little demands upon himself. 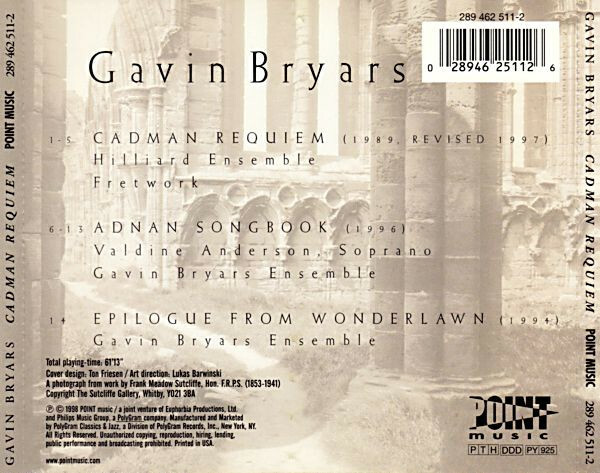 There’s too much facility and not enough challenge, I find, in this apparent simplicity of Bryars’ Adnan Songs. But Valdine Anderson has a stellar voice, and there is a beautiful touch when at the end of the fifth song, when clarinet takes over voice, and so similar are the timbres you can’t distinguish when one stops and the other has taken over. 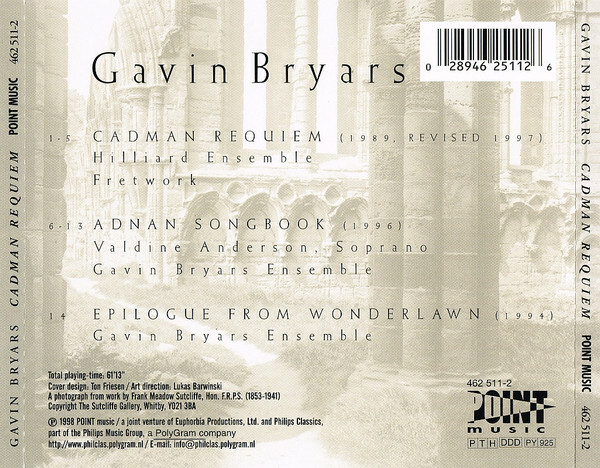 The Epilogue is excerpted (with some modifications in instrumentation and a few other changes) from a choreographic piece composed by Bryars, Wonderlawn, and though composed before the Adnan Songbook, Bryars says he regularly uses it in concert as a coda to the cycle. This is precisely the kind of music that makes me very skeptical of, if not downright hostile to minimalism and neo-simplicity. Clichéd harmonic progressions, saccharine and sentimental atmospheres, other than a few glissandos here and there Epilogue sounds like cheap film music for a sentimental romance. This is neo-simplicity for the dummies. In the same vein but much better, Busoni already wrote “Berceuse élégiaque” (Elegiac Lullaby), and that was about 90 years ahead of Bryars. But I won’t give up on Bryars. So far the pluses outweigh the minuses.